As if we needed another reason to be terrified of mannequins. 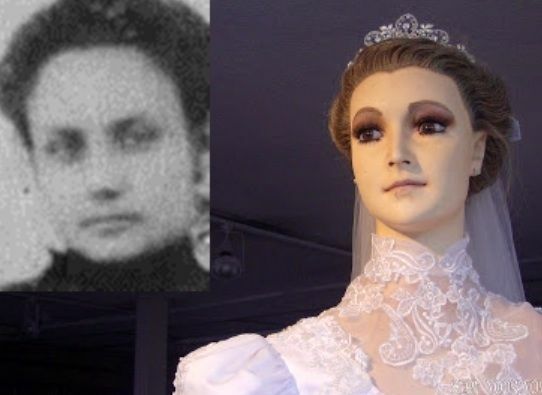 A popular bridal shop in downtown Chihuahua City, Mexico is rumored to have a mannequin that many speculate isn’t a mannequin at all, but rather, an embalmed corpse. La Popular has been a cornerstone of Chihuahua city for more than 80 years. The mannequin, which has been dubbed “La Pascualita” or “Little Pascuala” which according to Wikipedia roughly translates to the feminine form of the name Pascal, which celebrates Easter or Christmas, with the focus on Christianity. The tourist attraction has been sitting in the window of La Popular since March 25th, 1930. Many speculate that this mannequin is actually an embalmed version of the original owner’s daughter, as the figure closely resembles her according to local myth. However, there is one expert that is weighing in on the subject. Caleb Wilde, who runs the popular blog Confessions Of A Funeral Director, has been working as a certified funeral director since 2007 in Pennsylvania. Caleb weighed in on “La Pascualita” and the speculations around the mannequin actually being an embalmed corpse, and he had this to say on his website: “When you embalm a person “hard” (thoroughly flush them with strong embalming fluid), the lips and the eyelids will noticeably “dry out.” They will start to act like a piece of beef jerky in that all the moisture will leave the tissue, leaving it shrunken and wrinkled. If La Pascualita is embalmed, the facial features would probably be noticeably dried out. The face simply looks too supple. Of course, the “drying out” could be fixed with the right kind of cosmetology wax.” Caleb continues by saying: “I doubt La Pascualita is a corpse. It simply looks too good to be a 75-year-old embalming job. If the corpse is meticulously maintained, I suppose it’s possible (especially in a semiarid environment), but it’s highly unlikely.” Let’s take a look at the photos of this mannequin and why it has gained the notoriety that it has for so many years. 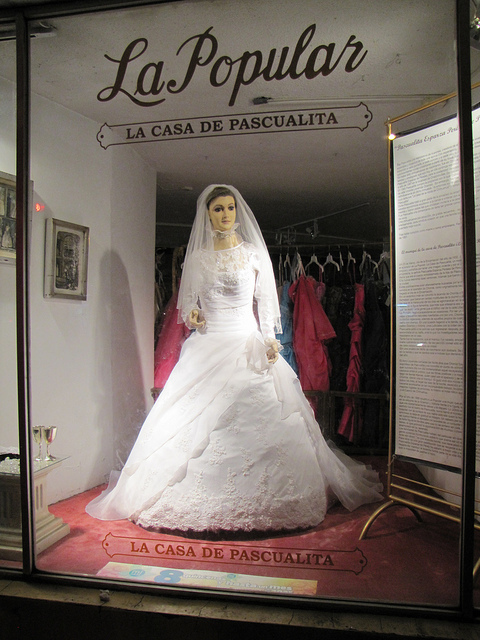 Here we can see La Pascualita standing in the window of the La Popular in Chihuahua City, Mexico. The Mannequin has been a cornerstone display of the bridal store since 1930. When you look at the archived photo of the late shop owner’s daughter and compare it with the facial features of the mannequin, you can see how people may have easily assumed it was the embalmed corpse of the young girl whose name has been lost over time, but now everyone refers to as La Pascualita. Her face is charming, with lifelike eyes, eyelashes, and even an expression that seems too human for a mannequin. 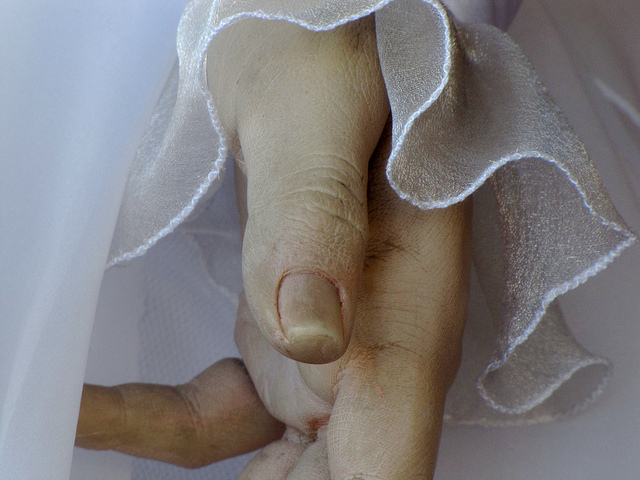 When you look at her hands close up, people truly speculate that this may actually be a corpse that has been embalmed. What is more likely, is that someone’s hands were cast in plaster of Paris, and then painted to look lifelike. Over the years, dirt and decay have given the hands an even more gruesome appearance. A close up photo of her eyes is even more frightening. The hair used for the eyebrows, as well as the wig, might even be human, but it’s mere speculation. A close look at the skin, however, makes this look more like it’s plaster or porcelain of some kind. 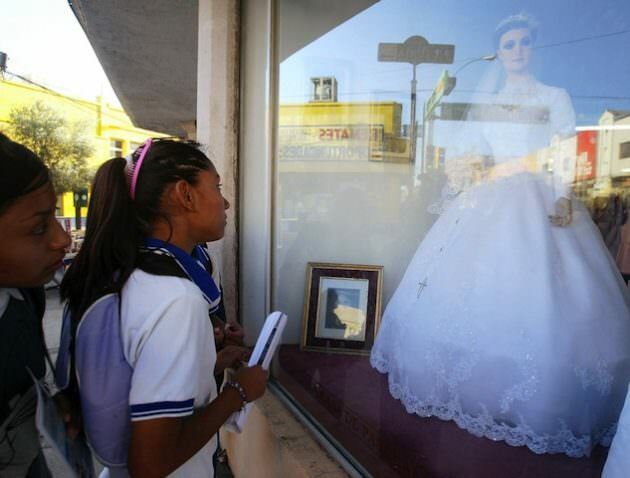 Tourists visit La Pascualita routinely, noticing that she has a lifelike appearance. A vintage photo at the feet of the mannequin of the late owner’s daughter gives it an added appeal. An onlooker looks into the face of the mannequin, unsure what to believe. A final glimpse of the face tells you how strange and eerie the legend behind this mannequin must be for it to become such an international sensation. What do you believe? Is this mannequin actually a body? Please “SHARE” on Facebook! Click “NEXT POST” to read more Providr stories.